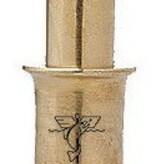 Dr. Slick’s Brass Hair Stacker is the perfect solution for all of your hair stacking situations. Stack hair easily and perfectly for great hair tails and wings. This useful fly tying tool is available in three sizes with a durable brass finish.